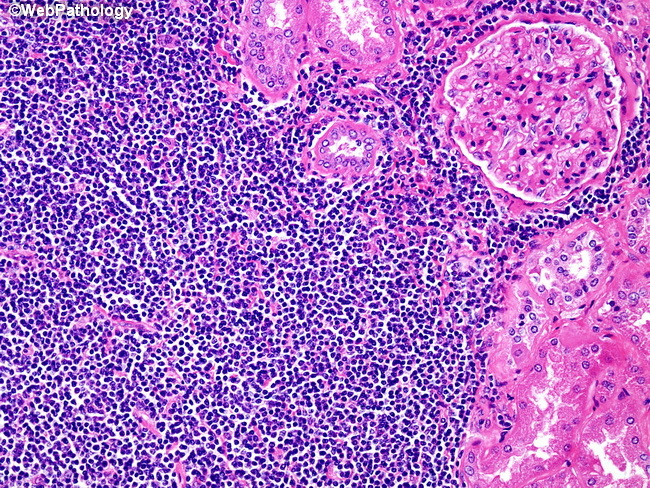 The tumor nodules are composed of small lymphocytes with rounded nuclei resembling chronic lymphocytic leukemia/small lymphocytic lymphoma. However, mantle cell lymphoma (MCL) lacks proliferation centers (growth centers) and prolymphocytes and paraimmunoblasts are absent. MCL is a mature B-cell neoplasm that expresses B-cell markers CD19, CD20, CD22, and CD79a. It has a tendency to express lambda light chains more frequently than kappa. Most cases of MCL carry the characteristic translocation t(11;14)(q13;q32) which results in juxtaposition of CCND1 gene next to IGH enhancer resulting in overexpression of cyclin D1.